IN OUR WARM, SALT WATER POOL! Work at your own pace in a friendly, encouraging environment. The time to start enjoying yourself begins now! Bring your friends. 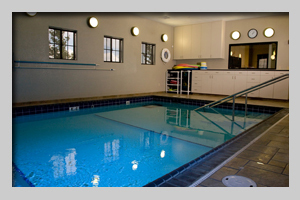 Our AQUA FIT class is a general conditioning class intended for all strength and skill levels. The class focuses on several different modalities of training including, cardiovascular and respiratory endurance, stamina, basic strength, coordination, agility, and flexibility. The different modalities are reached through bodyweight aerobic conditioning, the use of pool dumbbells, swim paddles, the natural resistance of water, and utilizing forward, backward, and lateral movement drills. Our Wellness Program Coordinator encourages all class participants to push themselves to achieve more than they think is possible. In addition, the program coordinator will tailor any movement to any participant with physical limitations while maintaining the same effect of the movement. The average thirty minute pool workout burns approximately 300 calories. It takes the elimination of 3500 calories to burn off a pound of body fat. A minimum three to four times per week pool workout is recommended, so a mere three to four weeks will result in measurable weight loss. Due to the resistance of water, pool workouts in just waist or chest high water is quite effective for weight loss, cardio and strength training. Buoyancy provided by the water allows you to move more easily with decreased stress on muscles, joints, and bones while increasing flexibility and balance. Resistance of the water allows for higher workout intensities while the support provided by the buoyancy of the water creates less impact on your body. Exercise performed in the water allows the heart to work more efficiently, making it a great cardiovascular workout. The pressure of the water on your joints and muscles comforts your body while you exercise, leaving you feeling less fatigued. Support provided by the water reduces the fear of falling. Warm water has even greater benefits. Besides the comfort of the temperature, immersing in warm water raises your body temperature and relaxes your muscles. This can benefit individuals with disabilities and conditions such as arthritis, fibromyalgia, muscular dystrophy, Parkinson’s disease, post polio syndrome and many others. Working out in a class environment has many positive effects. The first of which is making friends, being an active participant in our AQUA FIT class will result in meeting new like minded individuals who are seeking to better themselves. Training among others also provides a healthy competition, although this is by no means a competition and we only ask that you do your very best when taking part in AQUA FIT, if you enjoy a little bit of the competitive spirit our class welcomes your determination. Furthermore, the camaraderie you build in our AQUA FIT program will help to hold each one accountable for making it to classes and not letting excuses get in the way of our goals to make ourselves stronger and healthier.